Because Rachel was not able to attend the Spike Island workshop due to a last-minute flight cancellation, she visited the Kim Yong-Ik exhibition at the Korean Cultural Centre UK in London. To follow is her 800-word article informed by Kim and his work. 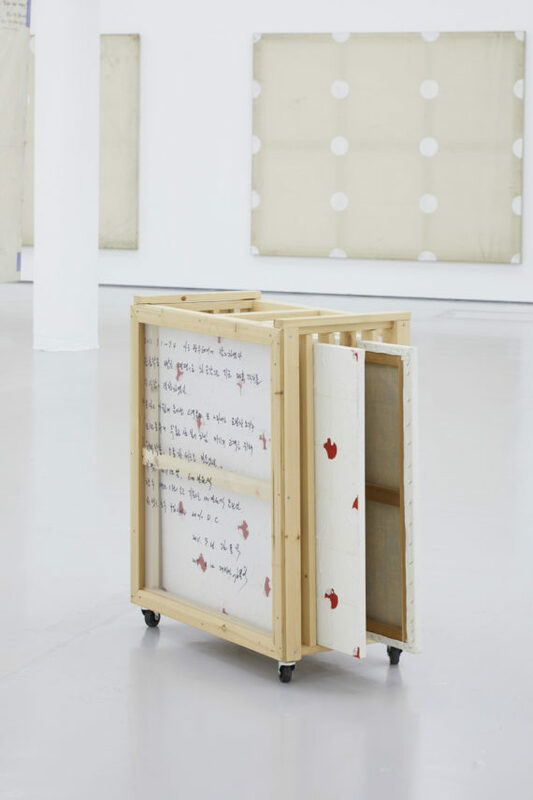 Two concurrent exhibitions at Spike Island, Bristol and the Korean Cultural Centre UK, London, have been exhibiting the work of Korean artist Kim Yong-Ik this autumn. The overarching title, ‘I Believe My Works Are Still Valid’ (also the title of a 1997 work by the artist) declares Kim’s resolve and strategic approach to exhibition and art making. Through reusing motifs, defying newness and sidestepping audience expectation, he pushes, prods and pokes the roles of art, artist and institution. 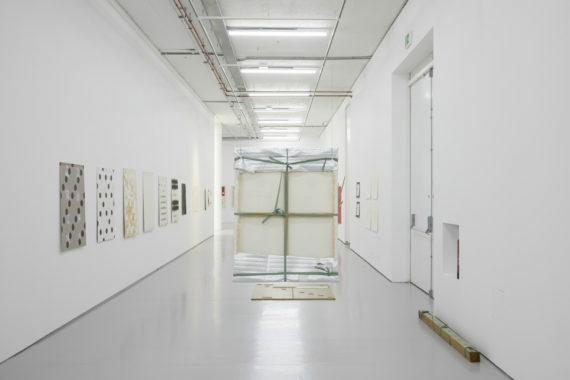 These solo exhibitions are the artist’s European debut, despite the septuagenarian being a longstanding pioneer of contemporary art through teaching, biennale appearances, writing, and co-founding artist-run Art Space Pool, Seoul. His sluggish rise is perhaps linked to the fact that he (deliberately) didn’t slot into either of the post-civil war artistic movements in South Korea. Instead, he ciphered elements from both Dansaekhwa (Korean Monochrome) and Minjung. The restricted palette and Zen-infused abstraction of 1970s Dansaekhwa has now been fully introduced to Western consciousness, with artists Lee Ufan and Park Seo-Bo becoming widely documented. But despite Kim studying under Park, he remained on the periphery, criticising the group’s Western aping. The opposing and revolutionary Minjung tradition used representational painting for its biting political commentary, and has also been afforded wall and book space. Kim, however, did not adhere to its socialist realism or figurative scenes. 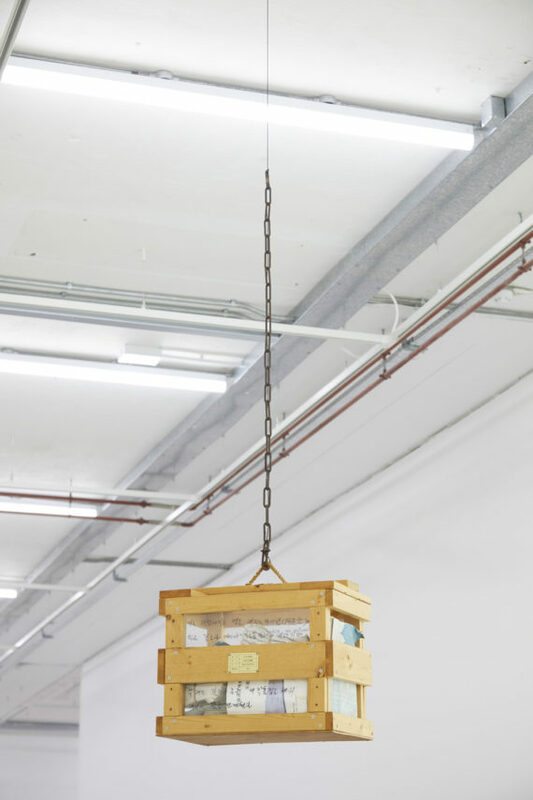 Spike Island presents Kim’s work from the 1970s onwards, and at KCCUK a new site-specific installation draws on an economy of means, spacing and tempo to guide the audience through its tricky space. Kim places canvases at shifting heights. Some feature his signature polka-dots in black or red paint, while others are utterly bare. Many of the circles are on the canvases, whilst others creep onto the wall in paint or pencil, narrowing the distinction between support and architecture. One circle straddles canvas, wall and neighbouring partition. Circles also nonchalantly punctuate across no-entry gallery doors. HG Masters in ArtAsiaPacific describes Kim’s polka-dots as “pulling out various ‘sacred’ tropes from modernist abstraction and then undermining their supposed integrity… Park Seo-Bo would have hated these works”. The uniformity of the polka-dots could at first be mistaken for Minimalist seriality, but the head-height circles are “thoughts”, and Kim views them as a culture or language. The canvases, meanwhile, are “human”, and the untouched ones are, according to the artist, free of thinking, agony and systems. Bliss? The whole installation is titled Utopia, 2017, and Kim acknowledges this unreachable realm: “My wish is for them to be a sedative with the toxin of impotence imbued within”. The calm, rhythmic dance and comfy, predictable reassurance of this canvas-circle-wall correspondence is abruptly broken, and circles are triggered across the KCCUK wall. Seven scattered black circles featuring tiny blue stars, form the arrangement of the Big Dipper, an identifiable constellation where answers are sought but often denied. According to the artist, this part of the exhibition “became a space that has materialized my ongoing intentions to create a collision between what makes sense and what does not”. It would be tempting to read the white, red, black and blue colours in this exhibition as referencing the South Korean flag, or easy to insinuate the white gallery walls and blank canvases as symbolic of traditional Korean dress, Joseon porcelain or Baeksaekpa (School of White). But the artist refutes my Western stereotyping and affirms “one cannot find the life of humans, history, or politics in my canvas paintings”. In 1960s Japan, the Mono-ha movement rebelled against Western modern art and Ufan’s empty canvases were left silently to speak with their surroundings. Like Mono-ha, the space at KCCUK is integral to Kim’s work, through minimal but concise artistic intervention. There is nothing new about painting directly onto a wall and Kim knows this. The BMPT group (Daniel Buren, Olivier Mosset, Michel Parmentier and Niele Toroni) in 1960s Paris had already pulled painting off the picture-plane and also criticised the artist-as-hero by undermining the originality and authorship of their work, often muddling who made what and continuously making the same work. Niele Toroni worked directly on the wall with his obsessive series Imprints of a No. 50 Paintbrush Repeated at Regular Intervals of 30 cm. 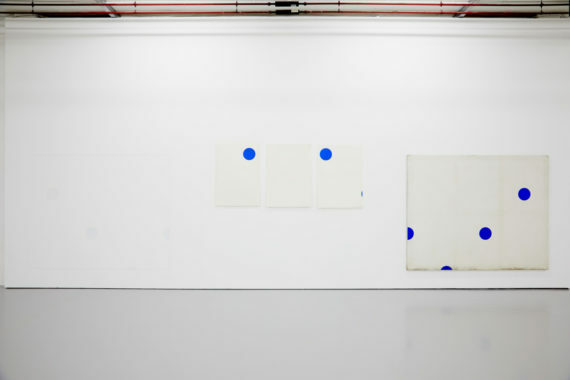 The ‘zero degree’ works by Olivier Mosset took this dissent from individuality and expression further with 200-plus identical paintings of black circles on white canvases. Kim knows, then, that his recent work is not an artistic innovation as this myth had been tackled decades before. Therefore, to still choose to rebel against newness, when this is not new in itself, is his artistic gesture, and through its weariness, comes potency. Kim’s consciously powerless act at KCCUK becomes a melancholic response to progression and action. He claimed modernism made him literally sick and therefore painting recognisable modernist forms is designed to passively tackle that injured heritage. The dots imbue meaning and coherence; however, that meaning is ambiguously meaningless. As young artists, we rush through our early years leaping from one subject to another, gobbling up arts experiences with a voracious appetite. We explore how we can make work which is in turn bigger, better, more meaningful, more shocking, more honest, more commercial. 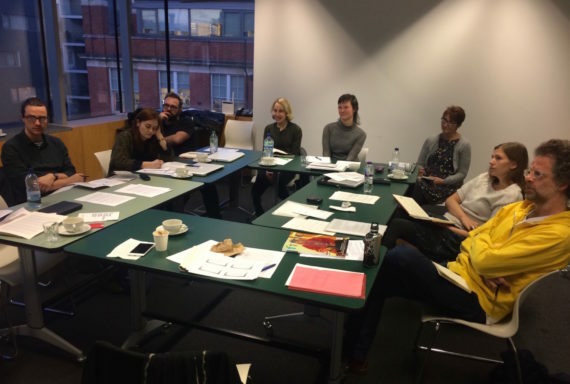 Alongside this, we grapple with the daily grind of arts practice, trying to develop a skill, trying to make something work and, crucially, trying to recognise the moment when we have found something worthwhile, something worth pursuing further. For some, a deep preoccupation exists from the very beginning – a passion which cannot be put to rest. For others, it is something which grows slowly, but which returns again and again, to be picked apart, dissected and reconstructed in a process which offers new ways of thinking about the question – whatever that question might be or might become. For Kim Yong-Ik, his preoccupation has been a ceaseless questioning of arts practice itself. Born in Seoul, South Korea in 1947, he was brought up during a period of extreme instability and repression in the country. He became an art student in 1969 at Hongik University in Seoul where he trained under the masters of Dansaekhwa, a tradition of Korean modernist painting. It was not long, however, before he became disillusioned with the constraints of the arts establishment. In an interview for Artnet Worldwide in 2016, Kim recalled his frustration with what he called the “self-confining circuit” of Dansaekhwa. This frustration led to his experimentation with alternative arts movements, marking the start of a persistent interrogation of the relevance of art and art making. This preoccupation became an ever-present feature of Kim’s practice which, he says in the same interview, “consumed my being to the core”. It’s an announcement that provokes both shock and a sense of liberation on behalf of the artist. At last it seems that the painful process of picking at the complex mesh of questions that encumbered him has finally reached a conclusion. As evidenced in the Spike Island exhibition, ‘I Believe My Works Are Still Valid’, through both his artwork and his writing, Kim has steadily accumulated a mass of work which, he explains, is now presented as “reinterpreted, restructured, and reappropriated” compositions. Lost or damaged works are remade, added to and altered; old and new are combined. The formality of modernism is partnered with the chaos of the organic. Through his insistent enquiry, an obsession that has governed his art-making, Kim has succeeded in creating an archive, a collection which has become the vocabulary of a new language. Each item can be endlessly recombined with others to construct new phrases and enable fresh readings of the work. Now taking on the role of editor and curator, his statement continues: “…the age of ‘development-creativity’ has come to a close, and one can now declare an age of ‘collection-compilation’”. Kim has brought together these components to create something far greater than the sum of its parts. 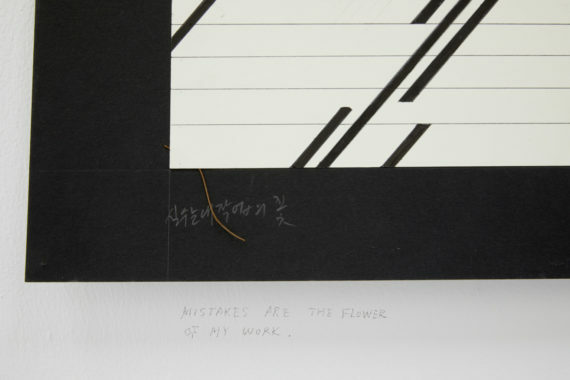 The fourth 800-word piece informed by seeing Kim Yong-Ik’s ‘I Believe My Works Are Still Valid’ exhibition at Spike Island, Bristol is by the Bath-based writer Trevor H. Smith. The writers were asked to include the following in the piece: a direct quote from the artist; a quote about Kim’s work from another source; and also biographical information about the artist. South Korean artist Kim Yong-Ik’s first European solo exhibition, ‘I Believe My Works Are Still Valid’ covers the past 40 years of his output. It includes many works that have been revisited by the artist – painted over, boxed, or annotated. Such is the importance of acts of removal and realignment in this artist’s practice. Born in 1947 in Seoul, the capital of newly created South Korea, Kim has lived through a period of momentous change in the country. First under direct US control and then during a civil war that followed the country’s independence in 1948, he has witnessed student uprisings, military coups, dictatorship and the imposition of martial law. Having rejected Dansaekhwa, Kim produced conceptual work such as Self-Identification of Plane Object 1 (1974), in which a canvas was folded, spray-painted in monochrome – even this radical departure retained something of Kim’s previous practice – and then attached to its stretcher, allowing the markings to reveal the canvas’s once folded history. Alongside this piece at Spike Island is Kim’s response to years of rule by military dictatorship, first exhibited at South Korea’s 1981 Young Artists Biennial. The work comprises three paintings packaged in cardboard boxes, stacked, and then labelled with their contents’ titles and dimensions. During the work’s initial installation, Kim made the pivotal decision to simply present the boxes as they were, giving it the title, Untitled (Dedicated to the Exhibition ‘Young Artists’ in 1981). In doing so, he combined the cultural, conceptual, and political strands of his practice, turning the work into a comment on state censorship and the autonomy of the artist. Caught between the Minjung (people’s art) movement and theoretical modernism, Kim chose a third way – one that allowed him to continue making politically-charged work but that would also sit within the conceptual framework of the modernist movements that had dominated contemporary art during his formative years. 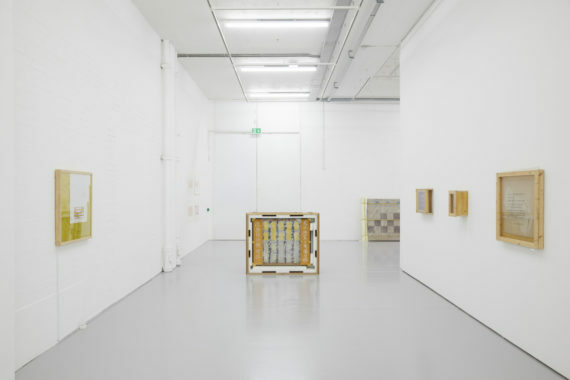 This typifies the rebellious streak that runs through Kim’s work; his ‘coffined’ series, in which canvases are ‘laid to rest’ in crates of wood and Perspex, kicks back against the curatorial control of the gallery. By un-framing paintings that were made 20 or more years ago and painting or writing over them, Kim is undermining notions of perfection and completeness in an artwork. 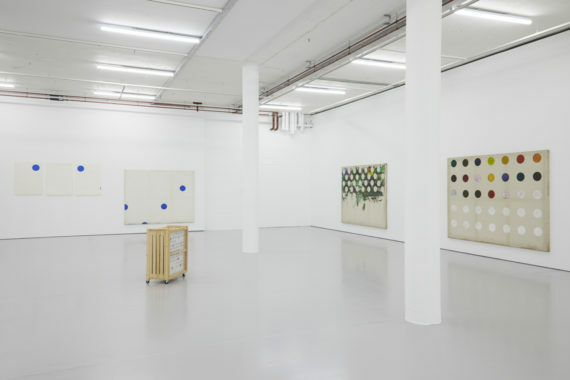 ‘I Believe My Works Are Still Valid’ contains many of Kim’s polka-dot paintings, from early works with their uniform grid formations to more recent and updated versions in which the dots have migrated across the surface of the painting, and in some cases entirely off the canvas onto the gallery wall behind them. Others have been painted-over, almost whitewashed, and given titles that reveal Kim’s enduring interest in the political history of his homeland, such as Apocalypse of Modernism (2017) and Erased Utopia (2016). These acts of erasure and omission align the work with strands that arose during the minimal and conceptual movements of the mid-20th century, where first the artist and subsequently almost all physical aspects were removed from the work. There is humour and mischief in Kim’s work that bears comparison to artists such as Keith Arnatt, whose Art as an Act of Omission (1971), comprises a single written document considering what it means to focus on the removal of content. Kim’s technique of revisiting work, even after it has been shown in public, chimes with Orwellian ideas about censorship, authorial control, and the rewriting of history. During the Cold War, such ideas were associated with extreme forms of government in Eastern Europe and indeed in the Far East. Now they strike a chord closer to home, enmeshed as we are in so much ‘fake news’. Having lived through the political upheaval of the 1950s and ‘60s, the brutally repressive regimes of the 1970s, and then, from the late 1980s, a period of political calm and unparalleled economic growth, Kim has shown he still occupies an uneasy middle ground – his own demilitarised zone where he straddles the political, the social, and the art-theoretical. In 2017, such an approach makes Kim’s work not only still valid, but perhaps more vital than ever. The fifth 800-word piece informed by seeing Kim Yong-Ik’s ‘I Believe My Works Are Still Valid’ exhibition at Spike Island, Bristol is by the Preston-based writer Martin Hamblen. A box hanging from the ceiling, above head height. An invigilator interrupts us, the box and I, to tell me there’s a translation on the other side. The box spins on its axis, under its own weight. I can go straight on, or left, or right. I could retreat, too. Straight on there are squares in a corner, nine. Next to it, a tic-tac-toe grid of grey cards numbered one-to-nine but out of sequence, the ninth bigger than the others and super imposed, at an angle. I feel like this is a witness statement, testimony which may or may not be a version of a truth. There are nine canvases draped and drawn on one wall in a sequence; drawn, then draped, drawn then draped. The day after seeing them I attach some significance to this and then, only because I have visited another exhibition and another artist reminded me that, 100 years ago when Duchamp’s original version of Fountain (1917) was exhibited, it was displayed under cover, before being withdrawn. A stack of three boxes. A canvas window. 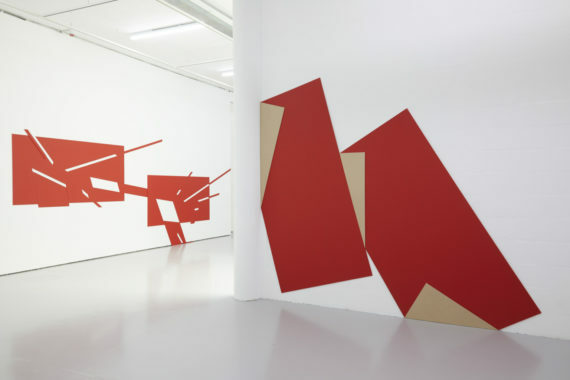 A red Roy Ascott Matisse cut up and out, controlled and ordered shards, deliberately detonated dominos. Black and white circles. Nine circles cut in nine squares, on the floor. Nine circles cut in ‘fake’ flooring, on the floor. A canvas on hinges, hung from a pillar. There are more boxes but ‘better’ – not cardboard, wood. Kim Yong-Ik calls them coffins. The Coffin of a Hermit ‘Despair Completed’ (1993-2014) concludes this series, “works that are shown with their wrappings and crates intact” explains the gallery text. ‘I Believe My Works Are Still Valid’ is Kim’s first exhibition in Europe. Asked in an interview for Artnet when he knew he wanted to be an artist, Kim described his Damascene moment: during his second year of studying Forestry in 1967, he was “arrested by an ambition to become an artist”. He switched from forestry to fine art and started a “new chapter of my life as an artist”. He completed his thesis on Duchamp in 1980. The stack of three boxes were first exhibited as part of the 1981 Korean Young Artists Biennale at The National Museum of Modern and Contemporary Art, Seoul, South Korea. “He folded his canvases into boxes, labelled them with the titles and dimensions of the works they held, and on arriving at the venue simply exhibited the boxes as a stack,” says the exhibition guide. My version: it’s a vertical triptych and a redaction “to his identity as a modernist painter”; a right angle from the flat two dimensional surface of paint to the three dimensions of sculpture. I imagine a body bifurcated, bolt upright in bed, asleep then awake. You can have the external but not the internal. What makes a dot polka? I don’t know but I have an idea, an apercu after visiting another art exhibition by another artist. Forgive my Freudian sleight of thought. The dots are drainage, holes at the bottom of a urinal, specifically Duchamp’s Fountain and its various versions. Polka dots may be meaningless but the “circle-shaped sheets” used, again and again, “to cover the painting beneath,” these “small deviations,” that now “speak for themselves” are speaking to me and my version of a truth. The dots are dynamic dissonance; worm holes which allow “theoretical passage through space-time that could create shortcuts for long journeys across the universe” (space.com). Kim’s versions of the truth, because he re-works his works of art, again and again, are not full stop conclusions but dot to dots joining entry and exit points. Ways in and ways out. 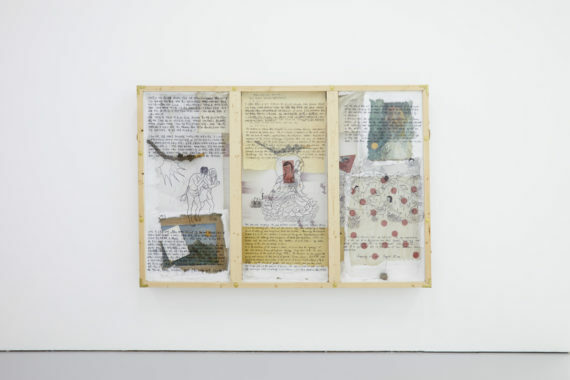 The third 800-word piece informed by seeing Kim Yong-Ik’s ‘I Believe My Works Are Still Valid’ exhibition at Spike Island, Bristol is by the London-based writer Carrie Foulkes. For this task, the writers were asked to include a direct quote from the artist, a quote about Kim’s work from another source, and also biographical information about the artist. The act of ‘entombing’ his works, visible in the ‘Coffin’ series, exemplifies the conceptual thread that runs through Kim’s practice. This encasing of pieces, rendering them unseeable, has multiple potential meanings, dependent on context. In the piece Untitled (Dedicated to the Exhibition ‘Young Artists’ in 1981), the refusal to show his work, to leave it wrapped and boxed, was a political gesture – an act of defiance against the repressive government at the time and the limitations of art in such an environment. ‘I Believe My Works Are Still Valid’ is an exhibition of unfinished works. An unfinished work is an open work, asserting an essential right to change over time, whether by chance, accident, or deliberate reworking by the artist. The process of wear, tear, weathering and decay imbues Kim’s paintings with a time-based element. They resist the static and fixed identities usually bestowed on painting as an object. The materiality of the surface of these works is inescapable. There is nothing pristine. In some cases the piece is completed by the ‘vandalism’ of others. What usually disqualifies a thing from being called art – damage – becomes an intrinsic element of the work. The dirty, imperfect, scarred, marred surfaces of Kim’s paintings and the rejection of the flawless surfaces of modernism set him apart from his contemporaries in South Korea. The artist releases his control over the work, which becomes infused with a time-based sensibility. The resurrection and remaking of past works forms part of an artistic ecology of materials and ideas, refusing to become finished. The triptych itself could be thought of as representing past, present and future, and the convergence of these three temporal states in a single work. Kim revisits past works as an act of rebellion against the notion of a completed work. He revels in the incomplete and the importance of process, maintaining a stance that subverts any formal reading of a painting as an object independent from context and the ecological system of artistic practice. The exhibition space at Spike Island provides a versatile site for the display of complex work that is at once installation, sculpture, concept and painting. Around each work exists the possibility of transformation, the promise of continued development. Writing about the show for Bristol 24/7, Jacob Warn describes this as “a methodological approach, to keep art in a state of constant [re-] creation, being weathered, lost, destroyed and re-made”. The walls of the gallery become extensions of the canvases, bearing notes in pencil written by the artist. The floors, walls and ceilings are used for display, with works stacked, hung from the ceiling and supporting columns. This is a fitting way to show work that resists categorisation, and encourages a deeper engagement with the pieces. This is an exhibition that demands to be read as a whole, charting the evolution of the artist’s practice and the recursive loop that sees him regenerating and re-contextualising past works. In this artist’s practice, nothing is resolved. An artistic and political ambiguity permeates the stained canvases. In Buddhist thought, the cycle of reincarnation will continue until a being reaches nirvana, or enlightenment. Writing on one of his ‘Coffin’ works, Kim evokes the bodhisattva Ksitigarbha (an enlightened being motivated by compassion to assist others): “they say that if you paint, create a sculpture, or mold clay in the shape of Ksitigarbha and keep it enshrined together with the deceased, they will be born again.” In the work of this artist, the symbolic ‘funeral’ or literal burial of an artwork is not the end of its life. Ideas and materials are continually reborn, taking on new bodies and new forms.